1. Gamification amps up competition among your sales team, allowing you to tap into their ambitious side. 2. It encourages collaboration among your sales reps — serving as especially beneficial for those working in field offices. 3. It inspires individuals to seek out mentorship from their peers and leaders. 4. It creates an engaging workspace. Businesses like Dyn, a New Hampshire-based technology firm, have seen gamification promote global bonding. Sales reps who had never met prior to the competitions started regularly congratulating and getting to know each other as they began competing against one another. And when they collaborate, best practices start rolling in, which helps everyone win together. Stemming from the collaborative element of gamification is the opportunity it creates for increased employee dialogue regarding challenges and best practices. When employees see where they rank on the leaderboard for different contests, they’ll get a better sense of their own strengths and weaknesses, because the ranking is all based on objective data. More often than you might expect, this inspires bottom-level performers to seek out coaching from either their sales leaders or top-performing peers. It doesn’t discourage; it actually inspires. It’s important to note that these two benefits, along with those of tapping into competition and creating an engaging workspace, essentially just stand as side products. They’re the bonuses that come along as companies use gamification to motivate the activities — such as scoring face-to-face meetings and taking products to market — that matter most to their bottom line. And that brings us to the best part: The four benefits the Inc. post shares are only part of the game. 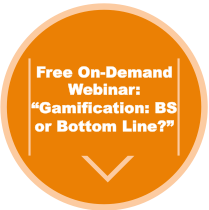 These 4 benefits show that sales gamification is more than a buzzword -- and they're only part of the game.